AC Line Cord, 1.8M, grounded, three-wire CEE 7/7plug. Associated Countries: Europe, Abu Dhabi, Bolivia, Dubai, Egypt, Iran, Korea, Russia, Vietnam. For power supplies PWRS-14000-148R and PWRS-14000-241R. AC Line Cord, 1.8M, grounded, three-wire CEE 7/7plug. Associated Countries: Europe, Abu Dhabi, Bolivia, Dubai, Egypt, Iran, Korea, Russia, Vietnam. 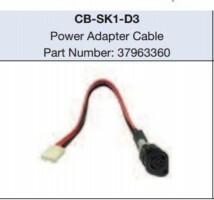 For power supplies PWRS-14000–148R and PWRS-14000–241R.